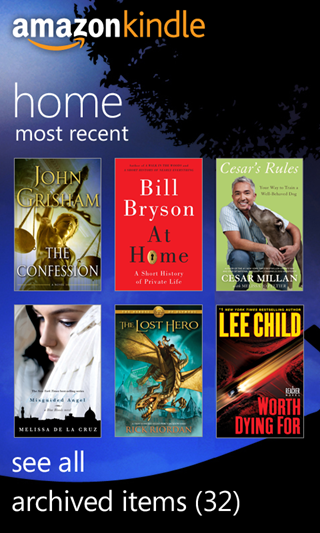 Kindle for Windows Phone 7 Now Available For Download ! The official Kindle app for Windows Phone 7 is now available for download in the Zune Marketplace. Kindle for Windows Phone brings over 750,000 books, magazines and newspapers from the Kindle platform over to the new Windows Phone 7 devices. • Shop the Kindle Store for over 750,000* Kindle books, including New Releases and 107 of 111 New York Times Best Sellers. Over 550,000* of these books are $9.99 or less, including 73 New York Times Best Sellers. • Choose from thousands of free classics, such as Pride and Prejudice or The Adventures of Sherlock Holmes. • Simply tap on either side of the screen or flick to turn pages. • You can also read your Kindle books on your Kindle, Kindle DX, PC, Mac, Android phone, iPhone, iPad and BlackBerry. Our Whispersync technology syncs your last page read, notes, bookmarks, and highlights across devices, so you can pick up where you left off. • Selection and price of books in the Kindle Store may vary by country. 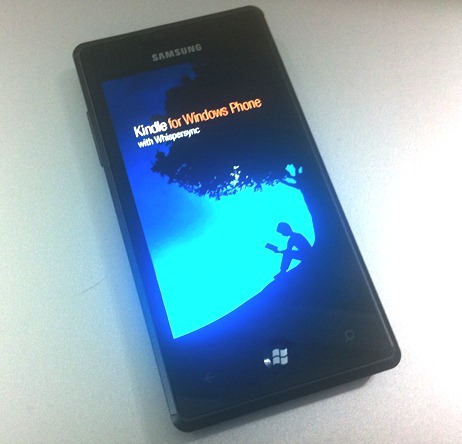 Kindle for Windows Phone 7 can be downloaded right now for free from Windows Phone 7 Marketplace.